Ontario's highest court has paved the way for a considerable cut to the size of Toronto's city council just weeks from a municipal election, but Mayor John Tory says the city's legal team has been told to continue fighting the province using any means available. Ontario's highest court has paved the way for a considerable cut to the size of Toronto's city council just weeks from a municipal election. Wednesday morning, a panel of three Court of Appeal justices stayed a lower court's Sept. 10 ruling that struck down a provincial bill that would reduce the council from 47 to 25 members to align the city's wards with provincial and federal electoral boundaries. The decision, which freezes the lower court's ruling for the time being, pending a formal appeal that's underway, means city staff will immediately begin preparing for a 25-ward election Oct. 22. Further, it will allow the Progressive Conservative government to avoid invoking the controversial notwithstanding clause of the Constitution to achieve its intended cut to council size. In its arguments earlier this week, the province's legal team said the stay was necessary to provide certainty to the city clerk, who is responsible for upholding a fair election. The timing and circumstances of the election were thrown into chaos when the PCs unexpectedly introduced the council-cutting legislation, Bill 5, after the campaign period had already begun. The city challenged it in Ontario Superior Court, and Judge Edward Belobaba ruled against the province, saying the legislation was unconstitutional because it violated freedom of expression rights for candidates and voters. The Court of Appeal, however, disagreed with his assessment, calling it a "dubious ruling that invalidates legislation duly passed by the legislature." "Unquestionably, Ontario's announcement of its intention to introduce Bill 5 disrupted the campaigns that were already underway. However, Bill 5 does not limit or restrict any message the candidates wish to convey to voters," the ruling said. "While the change brought about by Bill 5 is undoubtedly frustrating for candidates who started campaigning in May 2018, we are not persuaded that their frustration amounts to a substantial interference with their freedom of expression," it continued. "Candidates had a reasonable expectation that they would be operating under a 47-ward platform … However, neither that platform nor that expectation was constitutionally guaranteed. Unfairness alone does not establish a charter breach." The appeal court rejected arguments from those opposed to the stay that the province was responsible for the chaos surrounding the election and thus shouldn't be granted relief. "We do not accept the respondents' submission that, because Ontario exercised its legislative authority to enact Bill 5, it does not have 'clean hands' and should not be entitled to the equitable relief of a stay from this court," the panel wrote. Ontario Premier Doug Ford, in a media scrum in Washington, D.C., where he is being briefed on NAFTA talks, said he was pleased with the ruling. "I'm feeling real positive and we're going to move forward with it," Ford said. "We're going to move forward with building transit and infrastructure and housing in Toronto. I'm quite happy and I'm very grateful for the court's decision." 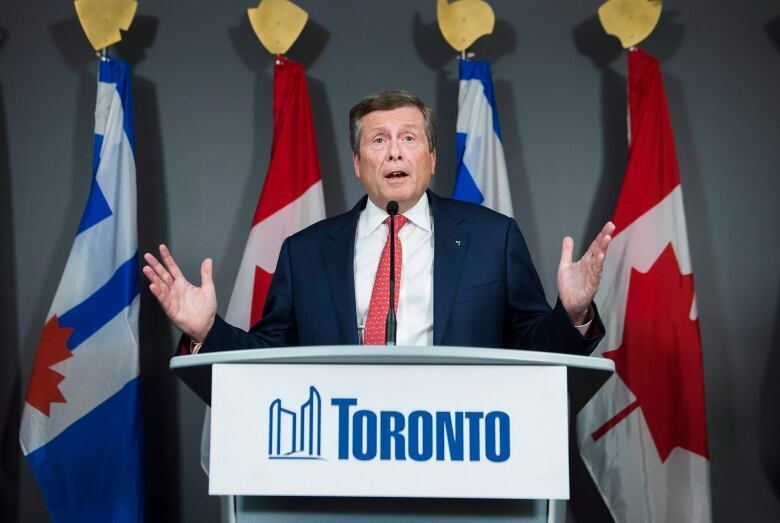 Speaking to reporters at city hall, Toronto Mayor John Tory called the situation "deeply regrettable" and said that much ill will could have been avoided if the province had sought a mandate to reduce the size of council and consulted with residents. Tory said the city's legal team has been ordered to continue fighting the province using any means available, though he did not elaborate on what options may still remain. PC MPP Stephen Lecce said the government is pleased with the ruling and Torontonians should be, too. Lecce said it amounts to "removing waste from government" and blasted city council for being "ineffective." Lecce reiterated the government's argument that a smaller council will lead to the city building key infrastructure, like transit and housing, faster, adding it will "unleash the economic potential" of Toronto. In addition to its successful request for a stay, the province responded to Belobaba's ruling by filing an appeal and introducing a second, nearly identical bill to circumvent his decision. Bill 31 includes a rarely used and controversial constitutional provision known as the notwithstanding clause. The province's legal team said in court this week that if a stay were granted, the government would not move to pass Bill 31. Speaking at Queen's Park, government House leader Todd Smith confirmed that no more action will be taken on the legislation. In his remarks Wednesday afternoon, Tory said the provincial government had set an "extraordinarily bad precedent" by threatening to pass legislation including the notwithstanding clause. Nevertheless, the appeal court's decision means the province is one step closer to slashing the size of Toronto council — a move that has drawn ire from legal scholars and activists. The outcome of the province's original appeal of the Ontario Superior Court judge's decision remains uncertain, and is unlikely to be heard by a court before the first week of November. However, in their decision, the appeals court justices said it too will likely succeed. "The question for the courts is not whether Bill 5 is unfair, but whether it is unconstitutional," they wrote. "On that crucial question, we have concluded that there is a strong likelihood that application judge erred in law and that the attorney general's appeal to this court will succeed." If the appeals court were to uphold Belobaba's decision, however, it's unclear what would happen next, as a 25-member council will by then have already been elected. In its written submissions to the court this week, the province's legal team asked that if Belobaba's ruling were upheld, the government be given a window of time to address the matter through legislation, rather than a reversion back to 47 wards imposed by the court. 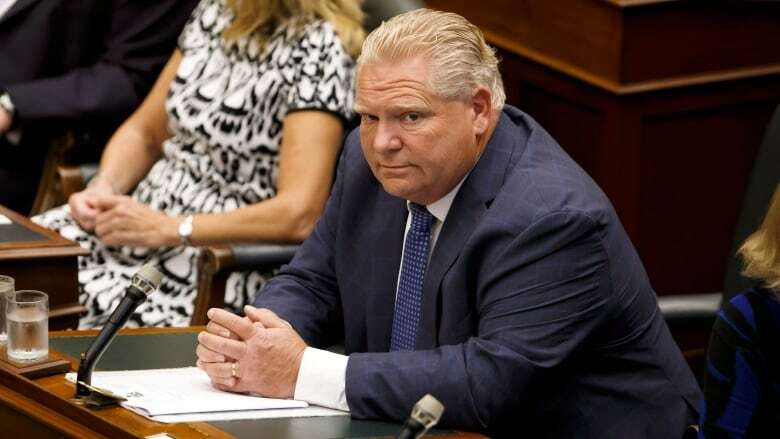 The news drew immediate outrage from both Ford's rivals at Queen's Park and his critics on Toronto city council. Andrea Horwath, leader of the Official Opposition, has pointed out that Ford did not mention slashing the size of city council during the election campaign. "After never mentioning it once on the campaign trail, the premier decided to rewrite the rules for municipal elections that were already underway, throwing municipal elections into chaos and trampling peoples' basic rights," Horwath said during a raucous question period. MPP John Fraser, interim Liberal leader, said the ruling is "not good for democracy." "I think most reasonable people would say, 'There's an election on, why are you changing the rules in the middle of the game?'" He said he's also concerned that Ford may threaten to use the notwithstanding clause in future legislative battles. Meanwhile, city council candidate Chris Moise, who was planning to run in the city's downtown core, said he feels like the province has trampled on his rights. "I feel pretty disappointed," he told reporters, saying he's poured months of effort into his council run. "My life has now changed completely."